There's now a Valentine's Day Baby Shark song and please no. 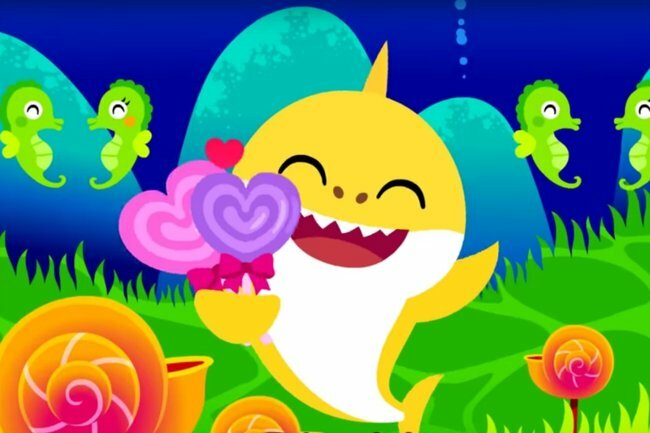 COVER YOUR EARS: The creators behind 'Baby Shark' have released a Valentine's Day song. I don’t even have young brothers and sisters. But for the last few months, I have been known to randomly break out into sing and dance. You see, I can’t seem to get ‘Baby Shark‘ out of my head. If you see those two words and don’t automatically begin singing “doo doo doo doo doo doo“, consider yourself very, very lucky. I suggest you don’t go to YouTube and search for it. Just don’t. You’ll end up living in an eternal nightmare like I am. Now, to make matters even more worse, the creators behind the ever-popular children’s song, Pinkfong, have released a new take on Baby Shark. A Valentine’s Day edition called ‘Valentine’s Day Sharks’. Although this is incredibly exciting news for kids – especially considering the original song has been viewed billions of times – I’m saying a silent prayer for all of the parents out there. The new song, which was released back in February 2017, has resurfaced following the soaring popularity of ‘Baby Shark’. Much like the Christmas version of ‘Baby Shark’, the Valentine’s Day version involves the same familiar melody and characters with the addition of new lyrics about the day. “I love you in the morning. And in the afternoon. I love you in the evening. Happy Valentine’s sharks!” one verse sings. As expected, the song also features plenty of “doo doo doo doo’s”. Earlier this week ‘Baby Shark’ reached number 32 on the Billboard Hot 100 chart, leaving Twitter very amused. Following the popularity of the original song, baby shark soft toys which sing the song became available shortly before Christmas. As the song goes, Mummy Shark, Daddy Shark and Baby Shark are all available to buy on Amazon – if you dare that is.